“I’m a Christian, a Conservative, and a Republican, in that order,” were words that movement conservatives have been waiting to hear from the rostrum of the Republican National Convention for at least the 32-years since Ronald Reagan last addressed the GOP’s national assembly. And while Reagan never put his conservatism in quite those terms, we knew just the same that’s where his values came from, and that gave Reagan the moral authority to be the leader of the conservative movement and, in the 1980 campaign, build and lead a new election-winning conservative coalition. So when Governor Mike Pence opened his remarks accepting the Republican nomination for Vice President with that phrase, and then proceeded to unabashedly embrace the cultural conservative agenda on national TV as part of a campaign that has largely been about brand, as opposed to policy and ideas, conservatives weren’t just pleased – they were overjoyed. Last night Mike Pence’s remarks demonstrated that he gets that existential truth in a way that Ted Cruz does not, and in so doing Pence made himself the de facto leader of conservatives. How long that leadership lasts, or if it will be contested, remains to be seen because there are still many notable conservatives who remain bruised over what they see as Pence’s failure to stand as strongly as he could have in Indiana’s battles over Common Core and the state’s version of the Religious Freedom Restoration Act. But in some measure elections are always about the future, and conservative complaints about Pence’s fortitude in those battles is in the past. … the choice couldn’t be more clear. Americans can elect someone who literally personifies the failed establishment in Washington, D.C. or we can choose a leader who will fight every day to make America great again. It’s change versus status quo. And my fellow Republicans, when Donald Trump becomes president of the United States of America, the change will be huge. While I’ve been acquainted with Mike Pence since he first entered politics in Indiana (we are both alumni of Hanover College), and I worked closely with him and his staff when I served on the staff of Representatives Adam Putnam and Jeb Hensarling, I’m not on the inside of Mike Pence’s political operation, but one thing came through loud and clear last night. Pence gets that this election is the ball game for conservative policy and constitutional liberty, and he understands in a way that other notable conservatives, such as Ted Cruz, seem unable to grasp that if we want to save our country right-of-center voter must invest their energy and put their trust in Donald Trump. We all better think very carefully — very carefully — about what this means for our Constitution and limited government. Elect Hillary Clinton and you better get used to being subject to unelected judges using unaccountable power to take unconstitutional actions. So let me say, for the sake of the rule of law, for the sake of the sanctity of life, for the sake of our Second Amendment and for the sake of all our other God-given liberties, we must ensure that the next president appointing justices to the Supreme Court is Donald Trump. But beyond the immediate threat of Hillary Clinton embedding her far-left agenda into law via an even more liberal Supreme Court, Pence’s remarks indicate he gets the bigger fear that is driving the Trump coalition – unaccountable power in Washington. CHQ Chairman Richard Viguerie often makes the point that the conservative movement has many effective spokesmen and women, what the movement lacks is leaders. There’s a new election-winning populist – conservative coalition coming together, but to become institutionalized and govern beyond 2016 it needs leaders. 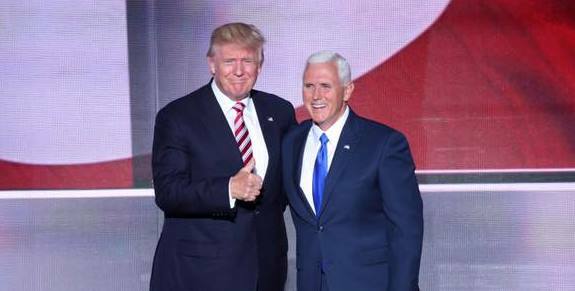 By joining the Trump ticket, and last night through his remarks to the Republican National Convention, Mike Pence showed he understands the Trump coalition is the future, and he showed real leadership by making himself an essential element of that coalition’s success in the 2016 election; future-focused conservatives now have the leader they’ve been looking for and it's Mike Pence.